Page revised in February 2010. S. Lorenzo fuori le Mura (without the walls) is located outside Porta S. Lorenzo along Via Tiburtina, the road leading to Tivoli. Because of its isolated position the basilica was surrounded by medieval crenellated walls, which were demolished in the XVIIth century; in 1704 the area in front of the church was redesigned by Alessandro Galli who erected a column and two lateral pillars which were decorated with the heraldic symbols (three mountains and a star) of Pope Clement XI, the reigning pope. 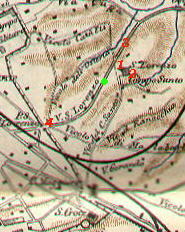 The view is taken from the green dot in the small late XIXth century map here below. 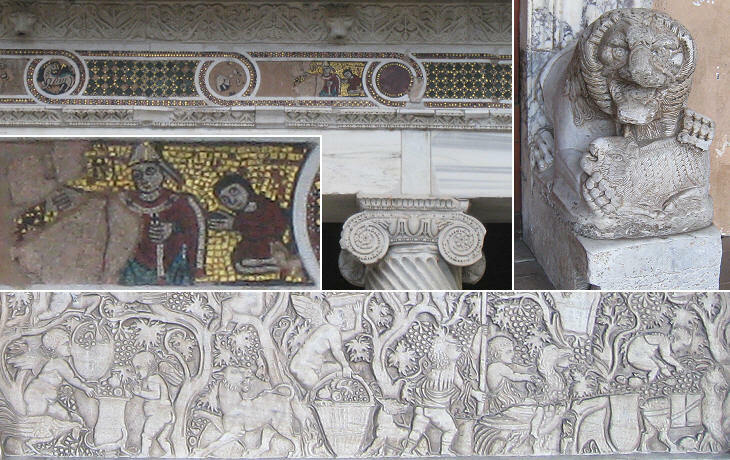 In the description below the plate Vasi made reference to: 1) Basilica di S. Lorenzo; 2) Monastery adjoining the Basilica; 3) Via Tiburtina (leading to Tivoli). The small map shows also 4) Porta S. Lorenzo. 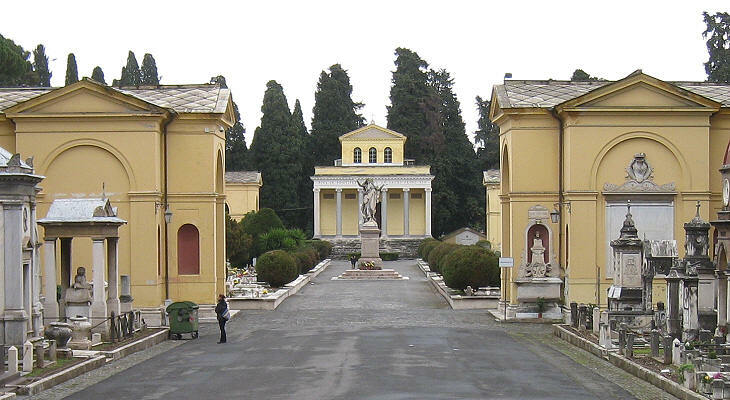 In 1855-64, during the pontificate of Pope Pius IX, the façade of S. Lorenzo underwent significant changes which were designed by Virginio Vespignani: in 1865 a new column was erected. Starting from the beginning of the XIXth century a large cemetery was built behind the church and at its sides. On July 19, 1943 the basilica was bombed by the Allies; the objective of the air raid was the nearby railway depot, but bombs fell on the façade and in the central part of the nave; the bombs fell also on the highly populated area between the basilica and the depot causing more than 3,000 casualties. Besides the military objective, the raid was aimed at weakening from a political viewpoint the Italian government: six days later Mussolini was arrested and his regime fell. The reconstruction has eliminated all XIXth century additions, but today's upper part of the façade does not correspond to any of the various façades which the basilica had through the centuries. Of the many Roman historical churches dedicated to St. Lawrence, three are associated with his martyrdom; S. Lorenzo in Fonte was built above the prison where Lawrence was jailed; S. Lorenzo in Panisperna was built on the site of his martyrdom and S. Lorenzo fuori le Mura where he was buried. 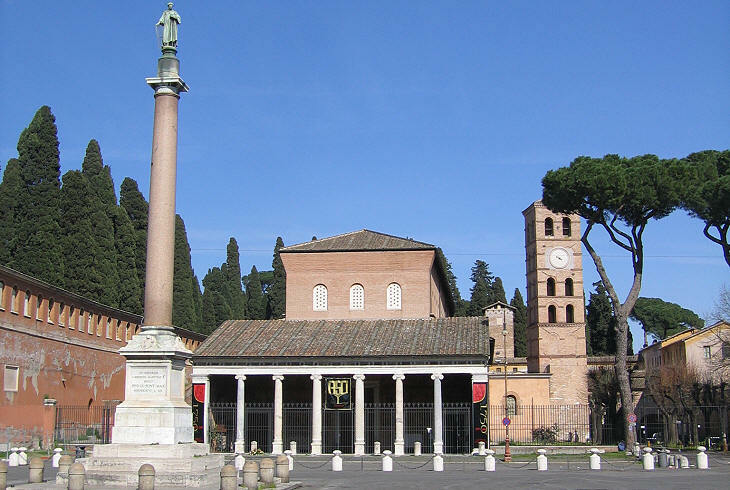 According to tradition Emperor Constantine ordered the construction of a large basilica above the crypt which housed the grave. In the VIth century a second basilica was built by Pope Pelagius II at the side of the first one which was abandoned and which almost disappeared after the IXth century. Towards the end of the XIIth century Pope Clement III fortified the basilica and the small nearby burg (Laurentiopolis) by surrounding them with walls; a few years later Pope Honorius III (Cencio Savelli) built a new basilica on the back of the old one and this resulted in its orientation being changed; the VIth century basilica had the entrance facing the east (an orientation very common in the ancient temples), whereas with the changes made by Pope Honorius III the façade looks towards Rome. The old basilica constitutes the choir of the united buildings while the naves are part of the new one; the two sections are slightly misaligned. The portico is a very interesting mixture of ancient and medieval elements; it is attributed to the Vassalletto, a family of architects/sculptors/mosaicists who with the Cosmati family developed a type of decoration which is usually called Cosmati work; they were also very able in imitating the ancient capitals and they did so in this portico; a small mosaic portrays the coronation of Pierre de Courtenay as Emperor of the Latin Empire which took place in S. Lorenzo in April 1217. 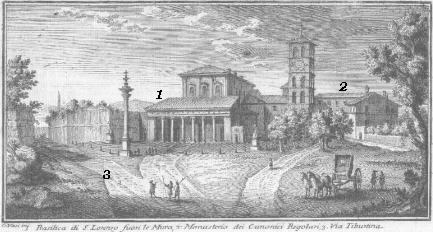 You may wish to see the basilica as it appeared in a 1588 Guide to Rome (in this page an etching by Antoine Lafrery shows the church still surrounded by walls). Cardinal Guglielmo Fieschi was the nephew of Pope Innocent IV and he assisted his uncle during a very turbulent pontificate. 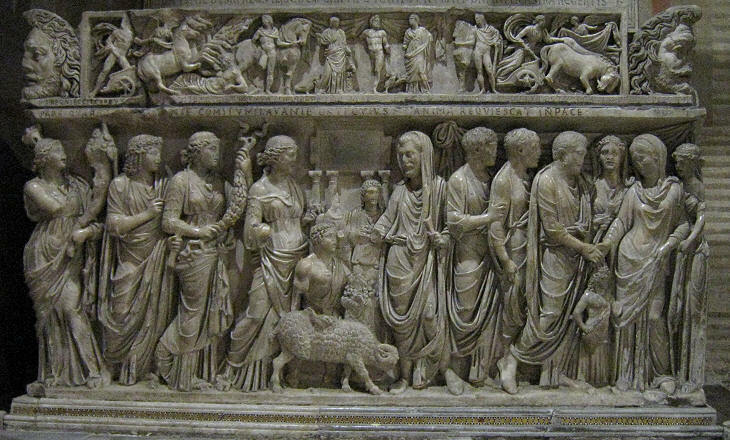 He chose to be buried in a very fine IInd century sarcophagus portraying a wedding: in the right side of the relief the groom and the bride are portrayed during the dextrarum iunctio, (clasping of the right hands) the culmination of the wedding rite which preceded the passage of the bride to her new family which was formalized by the words Ubi tu Gaius, ego Gaia (where you are Gaius, I will be Gaia); in the central part of the relief a sheep is about to be sacrificed; the stools upon which the groom and the bride sat while eating a ceremonial pie was covered with its skin (pellis lanata). The decoration of one of the medieval capitals led J. J. Winckelmann, the art historian who set the bases of Neoclassicism, to believe it was a work by two ancient sculptors and architects: Batrachus (frog) and Saurus (lizard). As a matter of fact it was not unusual during the Late Roman Empire to portray small animals inside a circular decoration (see an inhabited scroll frieze in Mardin) and the medieval sculptors copied that pattern. 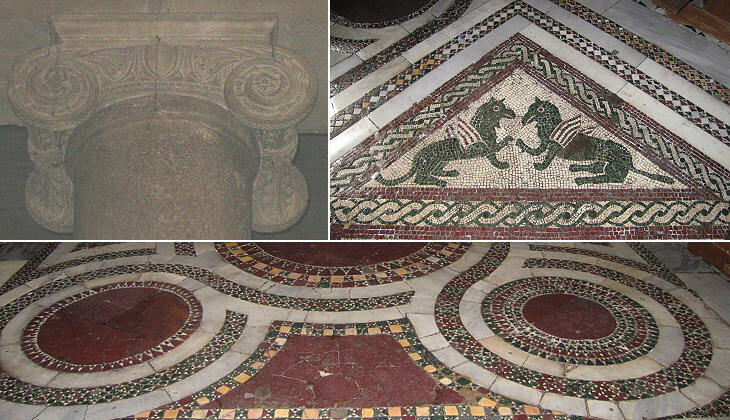 The fine decoration of the pavement had at its centre a square mosaic which portrayed lions, mythical creatures and two knights; it was most likely a reference to heraldic symbols of Pope Honorius III; unfortunately it was entirely destroyed by a bomb and it was possible to reconstruct it only in part. In The Innocents Abroad Mark Twain commented on the high number of Roman churches dedicated to martyrs; St. Lawrence and St. Sebastian rank at the top of the list; their acts do not have particular significance from a historical or religious point of view; most likely their popularity is due to the circumstances of their martyrdoms. St. Lawrence was a native of Spain; was ordained Deacon by Sixtus II, when raised to the Pontificate in 257; and appointed by him the first among the seven Deacons of Rome, a sacred charge to which were attached the care of the treasury of the Church and the distribution of its riches among the poor. In consequence of the sanguinary edicts of Valerian against the Church in 257 the aged Pontiff was apprehended; and, when being led to execution, was met by his faithful Deacon, who, inflamed with a holy envy and burning with an ardent desire to share his martyrdom, burst into these pathetic words: "Father, whither goest thou without thy son? 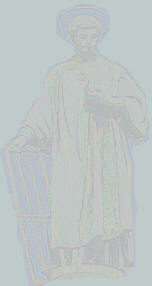 Whither goest thou, o holy priest, without thy deacon? Thou wert not wont to offer sacrifice without me thy deacon. Wherein have I displeased thee? try me now, and see if thou hast made choice of an unfit minister for dispensing the blood of the Lord. ""I leave thee not, my son." - tenderly replied the holy Pope - "For thee, who art in the vigour of youth, are reserved a greater trial and a more glorious victory." The riches of the Church inflamed the cupidity of the Praefect Macrian, who, to get possession of the concealed treasures, summoned to his presence their faithful guardian; but St. Lawrence presented to him in their stead the blind, the lame, the orphans, the widows, the poor in a word, who were supported by the charity of the Church. "Behold" says he "the treasures which I promised to show thee, to which I will add pearls and precious stones, those widows and consecrated virgins. The Church hath non other riches." "Do you thus mock me?" replied the disappointed and incensed praefect. "Is it thus the ax and the fasces are respected? I know you desire to die; but you shall die by inches." He accordingly ordered St. Lawrence to be bound with chains to a large gridiron placed over a slow fire; and thus did the Saint consummate with joy the holocaust offered in his person for the faith of Christ. During the French annexation of Rome an Imperial decree forbade burial in churches and within settlements; the French authorities started the construction of a large cemetery which surrounded on three sides S. Lorenzo fuori le Mura; the hygienic reasons behind the decree were understood by the popes whose rule was restored in 1814; however the part of the decree which limited the pomp and decoration of the tombs was disregarded and Pope Pius IX commissioned a large portico made up of a series of chapels. On June 14, 1870 Pope Pius IX inaugurated a Monument to the fallen at Mentana, a small town near Rome where in 1867 the papal troops checked the advance of Garibaldi and his volunteers. The statues portray St. Peter in the act of giving a sword to a medieval knight. A few months later, on September 20, Italian troops entered Rome near Porta Pia. 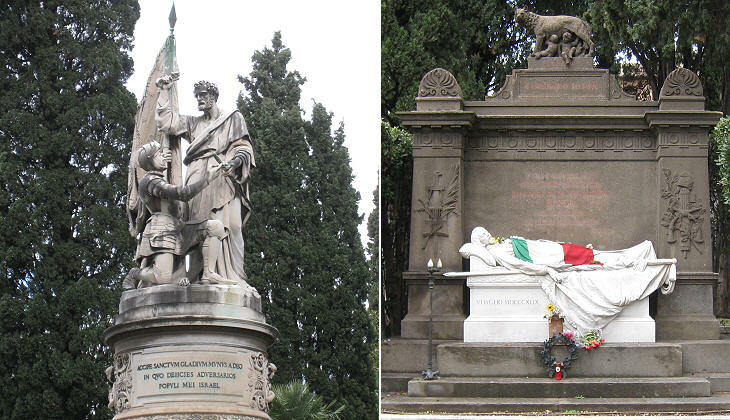 The Italian government built a monument to Goffredo Mameli, the author of the text of Fratelli d'Italia, the current Italian national anthem. He died in 1849 at the age of 22 during the Defence of the Roman Republic. Basilica di s. Lorenzo fuori delle mura Nel campo Verano, ove fu sepolto il santo Diacono, si osserva questa santa Basilica in un sito basso e arenoso. Il suo Fondatore si crede essere stato il Gran Costantino, e poi da varj Pontefici fu ristaurata, e ornata di marmi e di pitture. Si osservano le bellissime colonne di marmo striate, e specialmente quelle nel coro, ed in mezzo il ciborio con 4. colonne di porfido, sotto cui riposa il corpo del s. Titolare con quello di s. Stefano protomartire: esistono in mezzo della nave i pulpiti marmorei, chiamati dagli antichi ambones su i quali leggevansi al popolo li Evangelj e l'Epistole nelle Messe solenni, e da piede sonovi due sepolcri alla gotica con bassirilievi di marmo. Il quadro nel primo altare a destra con alcuni santi, che vengono seppelliti è di Emilio Sottino; la s. Ciriaca nell'altra cappella, che pure seppellisce altri santi Martiri, è di Emilio Savonanzio, ed il quadro nel terzo altare è del suddetto Sottino; le pitture a fresco furono però fatte da Domenico Rainaldi. L'altare sotterraneo, che sta a destra della tribuna è molto celebre per essere il primo, che fosse privilegiato; appresso a questo corrisponde il cimiterio di s. Ciriaca, in cui seppelliva i corpi de' ss. Martiri: Il s. Lorenzo, che distribuisce i tesori della Chiesa a' poveri, e la decollazione di s. Gio. Batista sono di Gio. Serodine d'Ancona, e la ss. Vergine del sudd. Sottino; le pitture però a fresco sono di Gio. Antonio, e Gio. Francesco allievi del Vanni, e li due depositi presso al cimiterio sono di Franc. Fiammingo, col disegno però di Pietro da Cort. Si nota, che in questa chiesa Onor. III. coronò il Conte Auxerre, e Jole sua moglie per Imperatori di Costantinopoli. You have completed Book 3. Move to Day 4!